PCI Express cards now available! 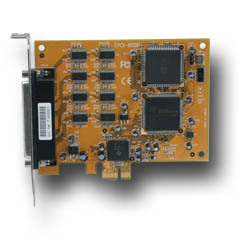 Vision Systems released the high-speed multiserial line with PCI Express interface. September 12, 2006 - Vision Systems GmbH, announces the release of the 8- and 4-port version for the H line PCI Express cards. The H-line PCI Express cards add serial ports to PC systems, as it is required in many applications. Serial ports are used for many purposes to connect devices to a computer. Label printers, bar code scanners, temperature sensors, fax modems are only some examples. The 128 Byte long FIFO of the 16C950 type UARTs make the H-line cards the best choice for high performance data transmission with low system load. The load is further reduced by using the flow control hardware on the UART chip. There is also a compatibility option to reduce the serial speed to a maximum of 115.200 bps, similar to Com1/Com2. Detail Specification | Inquiry this product: Art No (4480).